Beef original flavor, 1 box of 24 starting at $49 only, Shop now! Take 15% off entire order! Just use code 15OFF. Hurry Up! Cyber Weekend Sale! Take 30% off your order + Free Shipping! Just use code CHOMPINTO30. Valid 11/24-11/27. 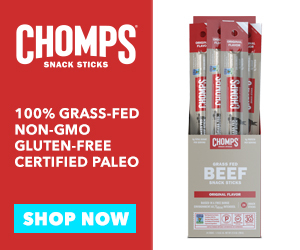 Chomps Snack Sticks offer a nice taste that is slightly smoky and slightly spicy. The taste is sure to make every snack time a mouth-watering experience. Jalapeno Beef sticks are great for satisfying hunger while tantalizing taste buds with their savory spices. Venison Chomps Snack Sticks feature the same savory taste that first made us popular: slightly smoky, slightly spicy and always delicious. Found a coupon for Chomps?